Acne is a common condition characterised by red, raised spots and rashes. It is found predominantly on the face, back and chest, although it can occur anywhere on the body. Our skin is covered in tiny pores and under these pores lie sebaceous glands that produce an oil known as sebum. Sebum helps to keep our skin supple and healthy. Acne occurs when our pores become blocked with dead skin cells and an over-production of sebum, allowing a build up and an environment suitable for infection. Acne is more common in adolescents, as puberty stimulates the production of sebum due to hormonal changes, but it can occur at any age. Hydrogen peroxide is a secret weapon in the world of natural acne treatments. This highly reactive solution is in fact water containing an extra oxygen molecule. When applied to affected areas its unique oxidative effect helps to unclog blocked pores allowing sebaceous glands to regain normal control of sebum production, thus reducing acne. When using hydrogen peroxide on skin be sure to always dilute it down to a concentration of 3% or less to avoid burns. The first step is to purchase some high quality, food grade hydrogen peroxide. This can be found on our website. Next, it is a good idea to remove any dirt, oil or make-up from your skin before applying hydrogen peroxide. Dry your skin gently with a clean towel. When skin is completely dry it will be able to absorb the peroxide more easily. Now take a clean cotton ball, soak it in 3% food grade Hydrogen Peroxide and gently rub it over the affected area of skin. Do not rinse your skin. After around five minutes you can apply a small amount of moisturiser to your skin. The H2O2s oxidative effect has a drying and astringent effect so it is more comfortable to moisturise afterwards but make sure to use a good quality moisturiser that is suitable for your skin type. You don't want to undo the good work and re-block the pores with a greasy, heavy moisturiser. Apple Cider Vinegar - The powerful antibacterial properties of apple cider vinegar make it one of the most popular and proven remedies in the treatment of acne as well as a whole host of other skin conditions. ACV contains naturally occurring Malic acid that is able to help balance the pH of skin and known to reduce visible acne in a matter of days. Manuka Honey - Another remedy that is often hailed as a miracle cure for acne is Manuka honey, this sweet tasting export of New Zealand not just great on your porridge! In fact, it contains a myriad of potent antimicrobial properties that make it perfect for combating even the most hard to treat cases of acne. Bicarbonate of Soda Exfoliant - About once a week, baking soda and water can be mixed together to form a paste and applied to the affected areas. Bicarbonate of soda helps to provide a gentle, simple exfoliant that will remove excess oil from the skin and help to dry up spot breakouts. 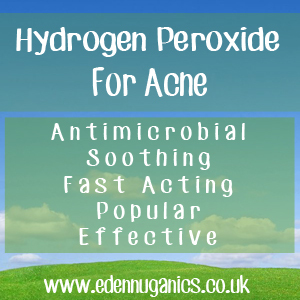 Hydrogen Peroxide and Acne: Does It Really Work?